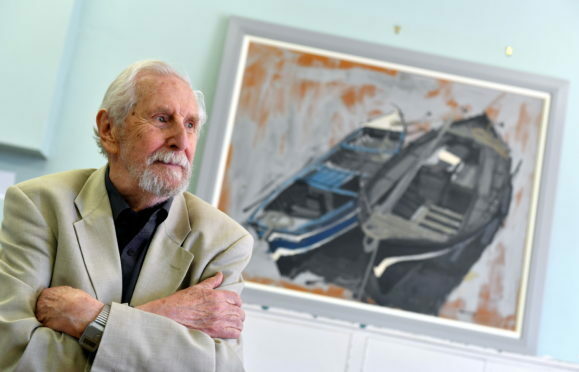 A renowned artist has returned to the north-east coastal village which inspired some of his early works. James Morrison, whose work is owned by the royal family and J.K Rowling, lived in Catterline while he was a visiting professor at Hospitalfield House, Arbroath in the 1960s. Much like celebrated artist Joan Eardley, he found much inspiration in the scenic Mearns coastline. Yesterday he returned to the village to rededicate one of his paintings of the pier to the community which he first handed over when he lived there. The painting had been hung in Catterline School for decades but some in the village were unaware of its origins. A small group of guests and pupils were invited to listen to Mr Morrison describe his painting, his career and his time in Catterline. Dave Ramsay of the Mearns Heritage Services said: “It was at a recent school event, that Gordon (Ritchie, of Stonehaven Heritage Society) pointed out that not many people realised that the painting in the school hall was by James Morrison, and had been gifted to the community. A plaque has now been commissioned to hang alongside the painting which will provide a biography of Mr Morrison and his letter of tribute to Joan Eardley following her death in 1963.